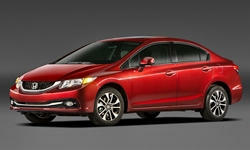 2013 Honda Civic Pros and Cons | Page 1 of 1 | Why Not This Car? What drives people to buy (or not buy) a certain car? TrueDelta's members share 2013 Honda Civic pros and cons based on their real-world driving experiences. Some car reviewers won't write an overtly negative review. They'll focus on whatever good qualities the car has, disguise their criticisms as faint praise, or simply not write anything. Anyone who's familiar with my reviews knows I'm not such a reviewer.